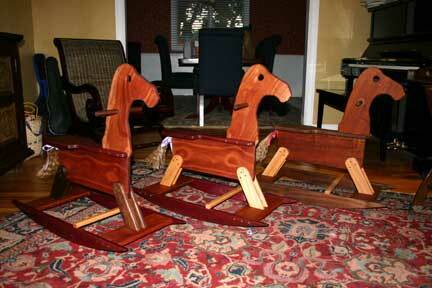 Below are some pictures of some rocking horses that I made for our kids and some of my nephews and nieces. 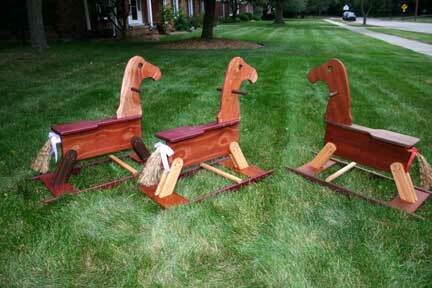 All were made of solid wood with dowel and glue construction. The finish is food-grade sesame seed oil, which is non-toxic (great for kids who need to put everything in their mouths). The tails are natural sisal rope. Somewhere I have some pictures taken while building them, but this will need to wait for some more unpacking to find them. 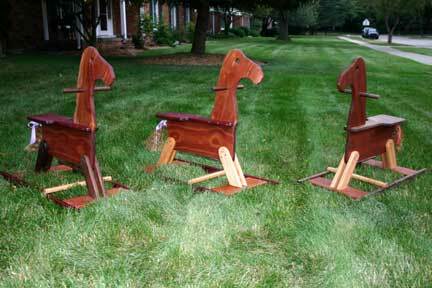 I have built three horses at this time, all with basically the same pattern. The one on the right was the original one, and the two on the left were made in the second generation. In the pictures, the original one has a red ribbon on the tail, and the second generation ones have light purple ribbons. They look very nice sitting out in the grass. One of the second generation. Four different woods were used in this one. The head, body and leg supports are a mix of African and Honduras mahogany. 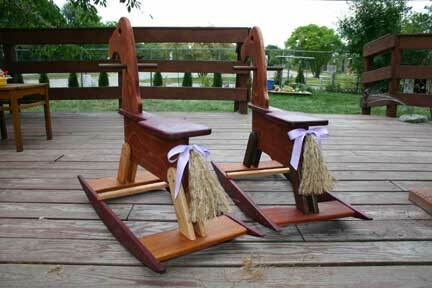 The seat and runners are purpleheart. The legs and handle are black walnut. 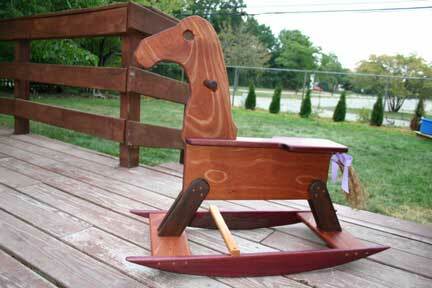 The shoe support is red oak. Some minor variations between this one and the other second generation one were due to the wood I had available (e.g., the other second generation has red oak legs). 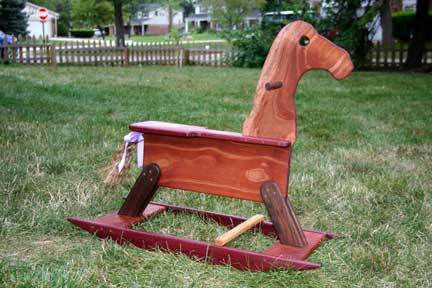 The first generation one used mahogany, red oak and black walnut. Mahogany was used for all the large pieces, as this was the only lumber I could easily find with the 10" width needed. Monica "puffed" out the tails, and added ribbons. We let them inside for a while. The original one (in the back) was made around January 2006. The other two were made around July 2006.